I suspect like many people I have numerous boxes of camcorder video tapes acquired over the years, some are the older 8mm video format and the later ones being Digital 8mm. Many of the videos are recordings of me running my dogs in agility competitions and others are the normal holiday type, obviously they all have a strong sentimental value. A few years back I had made a start in archiving tapes onto DVD but didn’t get too far because of time and other commitments. I was already acutely aware that the Digital 8 format had almost gone the way of Betamax with Sony not producing any new cameras and was aware should my trusty used and much abused Sony camcorder fail I would unable to view them. However the bewildering range of current equipment and the move to hard drive base equipment filled me with dread and I’d kept put off making a decision on a replacement and continued to use the camera as normal. Well the enviable happened a few week back and the camcorder started exhibiting playback issues, lots of coloured mosaic banding. Thankfully eBay came to the rescue and I’ve finally managed to get a good condition used replacement camera at a sensible price. It is obvious I am not alone in this predicament given the frankly amazing prices some other auctions finally went for. 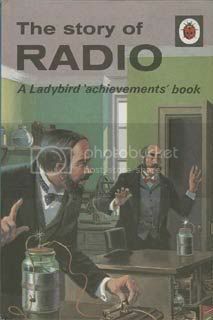 I have just successfully bid on ebay for a copy of The Ladybird Book – The Story of The Radio I was browsing earlier and stumbled across Tony Ling’s website and it features an altered picture of the front cover and it sparked some nostalgia. This was a book I was given as a child and remember being enthralled by its contents. As the blurb says the book tells the fascinating story of radio, from the early forecasts of James Clerk Maxwell and the experiments of Heinrich Hertz and Marconi to the modern Post Office Tower (remember it was first printed in 1968) and the use of radar. I might go looking for a copy of the 1972 Making a Transistor Radio and might actually have a go at building one, but there are some pitfalls in it’s design!